Domino is a cat. How could I resist a novel told from the perspective of a cat? 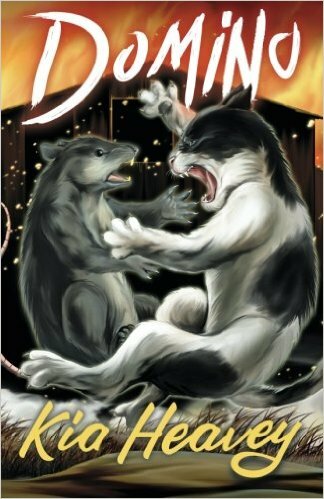 The opening scene in which Domino chases a rat and then meets a lady-cat was just so perfectly “cat.” This book isn’t cutesy even though the cats, rats, dogs, hens, and so forth all talk. This is not a children’s book, although older children could understand it. Domino is published by Kindle Scout as fantasy or fairy tale, but it seems to be more a mix of a naturalistic tale about cats and an allegory into which people will no doubt read their own interpretations. The plot seems to be essentially about the question of embracing or rejecting nature, with the good guys coming down firmly on nature’s side. The barn cat Domino visits cat friends, and they prowl. He hunts, finds a mate, raises kittens, and patrols his territory. The story is very true to cat behavior, and is a delight for cat lovers. The descriptions of farm, street, and woods ring true. The natural world burgeons with messages in scents and tracks, very much as a cat would see it. There is a deep respect for nature pervading this book, in the descriptions, the action, the plot, and in what seems to be the moral of the story. Reading this, I felt as if I was in the woods myself, seeing the melting ice, feeling the warmth of little patches of sunlight, reading a scent map of who has passed which way. This being a novel rather than a tone-poem, there is a plot, and the neighborhood, the farm, the woods, the cats, Domino and his family, and even his humans and their dog face a threat. The antagonist is the new cat on the block, Socrates, who preaches transcendence of nature. Socrates and his followers are against killing rats and for befriending dogs and other animals. At first Socrates seems harmless, preaching nonviolence, but then he starts enforcing his dictates by controlling his owners’ pet dog, thus monopolizing violence and the threat of violence. He sets up an oppressive government. His subjects starve and exhibit learned helplessness under his murderous rule, all while he justifies this oppression with his philosophy. Like the pigs in Animal Farm, Socrates sets himself above other animals and tries to become more than an animal. Like Orwell’s pigs, the more Socrates becomes like a human, the more he becomes as evil as any human. Socrates is not just corrupted by having power, but is evil from the start because he seeks power over others. As with other stories of good versus evil, this allegory can be interpreted different ways to suit the reader’s perception of evil. In Socrates’ dictatorship, some will see the evils of communism, as in Animal Farm. Some will see the transcendence creed and Socrates’ rise from street preacher to absolute dictator as an allegory of the evils of a state religion. In the description of the rats as dirty and disgusting, some will see any group they themselves perceive as dirty or disgusting. Some readers will want to tie the story to events current at the time of publication, or at the time they are reading it. Unlike Orwell’s Animal Farm, it is not only the dictator’s subjects who are at risk, but the balance of nature. The cat society’s decision to follow Socrates and stop controlling the rat population results in a landscape barren of the small rodents who belong there, out-competed by the invasive species. The land loses the songs of the small birds whose eggs the rats eat. The woods become a tree-filled desert. When Socrates and the other bad guys are on the scene, the story reads as allegory, because the bad animals act like humans. When Domino is alone or with his friends and family, the cat characters in the scene all know they are cats and act like it. The scenes with the good guys read as naturalistic rather than allegorical. The cats’ true natures shine, and these scenes are a treat for cat lovers. This is a magnificent, touching story. It pulled emotions from me and kept me up late reading. It can be read for pure enjoyment, or for its deeper meaning. It’s full of tragedy and triumph. Although this was published as genre fantasy fiction, it has definite appeal for the reader of literary fiction. I highly recommend this book for all readers, teen and adult, fantasy and literary, and of course most especially for my fellow cat enthusiasts.